The Barcode Web Fonts uses a CSS @font-face selector to generate the barcodes. ConnectCode Barcode Web Fonts is based on the True Type barcode font engine that has been proven in many fortune 500 companies. The font engine has passed numerous audits and barcode verification tests. The Barcode Web Fonts combines the barcode fonts engine with the latest web technologies that complies with the World Wide Web Consortium (W3C) standards. This allows users to create barcodes in the web using fonts instead of images. Using a barcode web font is efficient as it only requires a single font to be downloaded to the browser and is able to generate multiple barcodes thereafter. Barcode fonts also raster to the output device and are not limited to DPI (Dots per Inch) of the computer screen. The versatility of a barcode font also makes it a popular solution for integrating with existing enterprise projects as it neither depends heavily on the programming environment nor requires intensive graphics operations. Instead, a slight manipulation of existing text is usually sufficient to produce robust and scannable barcodes. ConnectCode Barcode Web Fonts internally uses the @font-face CSS font selector as shown in the HTML headers below. In Internet Explorer, the selector uses Embedded OpenType (eot) files while on other browsers it uses Open Type fonts (otf) and Web Open Font Format fonts (woff). Complete details on customizing the barcode web fonts. The script below shows how to use jQuery to validate the data and transform the data into barcode characters. 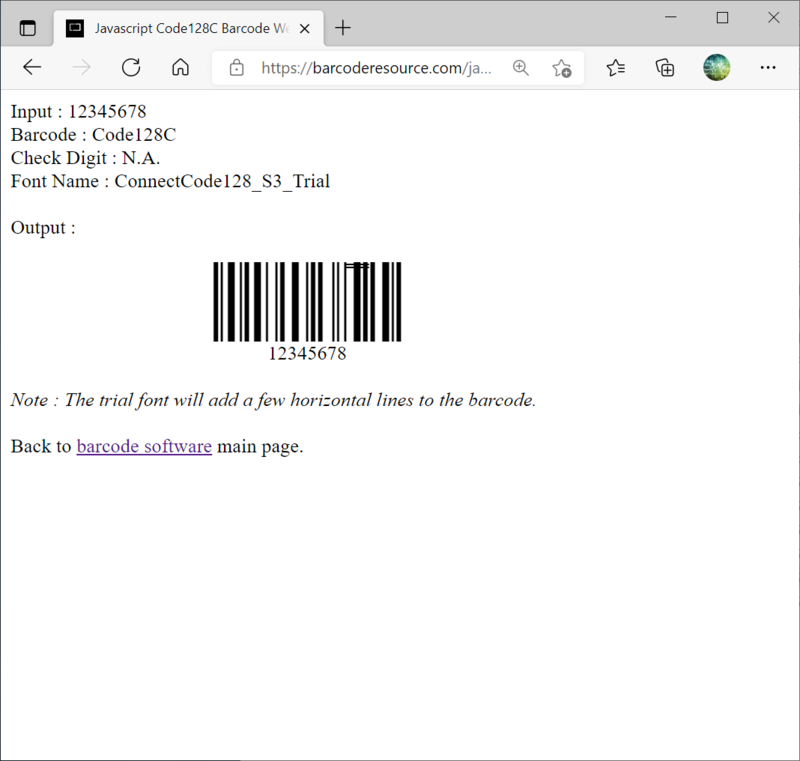 ConnectCode strongly recommends users to migrate from the previous versions of Barcode Web Fonts to this latest version. This latest version uses Embedded Open Type (eot), Web Open Font Format (woff) and Open Type (otf) barcode fonts instead of True Type fonts on a web page. This change enables the generation of barcodes using fonts on a wider variety of browsers in different operating systems such as Windows, Mac OS X and iOS. For a list of supported and certified browsers, please refer to the "Supported Browsers and Platforms" section. The True Type web fonts from previous versions are still supported. How do I migrate from the Open Type barcode web fonts to the Web Open Font Format barcode web fonts?